Stephen Hawking (Eddie Redmayne) is a talented graduate student at Cambridge University who appears to lack direction in his studies when he meets Jane (Felicity Jones). Their romance is tested when he receives a diagnosis of motor neurone disease (MND). The film looks of Stephen Hawing’s life is both sympathetic and inspirational, with excellent performances by the two leads who deserve their Academy Award nominations for best actor and best actress. 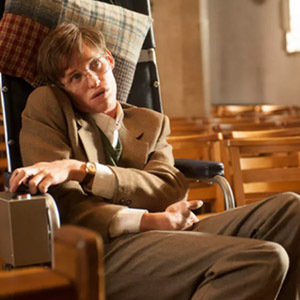 Whilst Hawking is probably the most famous astrophysicist in the world; the film focuses on the human condition rather than mathematics and science. It follows the young Stephen Hawking chaotically preparing his PhD despite his extraordinary ability, as he enjoys college life with his peers. All this is happening whilst he is romancing Jane Wilde, another graduate student at Cambridge University working on her own PhD, on literature, not science. Their time together appears to be a fairy-tale, as Jane comes to terms with Stephen’s quirks, but then things change. He begins to lose his sense of balance; his hands begin to shake, he takes a fall. His diagnosis of MND and the prognosis that he will die within two years forces her to consider whether their relationship can last through the months they have left together. Stephen’s father tries to persuade her to call off the relationship, but she instead states her love and encourages Hawking to find his own path in the time ahead. The progression of the disease tests them both beyond their known limitations. Hawking loses his independence as he moves from using just one walking stick to two and then faces life in a wheelchair. 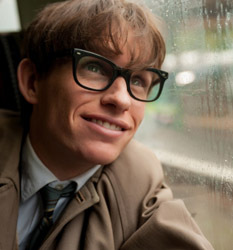 Eddie Redmayne’s physical transformation to become the familiar figure of Hawking that became well known in later years has been compared in excellence to Daniel Day-Lewis in My Left Foot. A stick becomes two, and as his children are learning to walk, Hawking’s own ability to walk diminishes as he faces the need for a wheelchair. His work is then threatened by the loss of his voice, the most difficult challenge for this outgoing intellectual. Jones’ performance subtly conveys the feeling that Jane, thinking she could cope over the two years Hawking was initially told he had left to live, begins to flail when she realises he could survive for decades while slowing needing ever increasing care. At the same time, Hawking is consumed with his research, at times neglecting the strain that this puts on his wife as she looks after him and their children. Yet, he retains his charm, his humour in all but his worst days. As their marriage looks to be falling apart, this extremely intelligent couple retain mutual respect and consideration, trying hard to do the right thing, though not always successfully. It appears almost too good to be true, so this may be more a dramatic convention than the reality of the time. Yet this deep commitment held by them both proved vital in solving some long-standing secrets of the universe. Read more about Stephen Hawing’s life and work.